The Democratic Congressional Campaign Committee (DCCC) is trying to raise money for 2016 House races with its own version of Donald Trump’s infamous “Make America Great Again” hat. 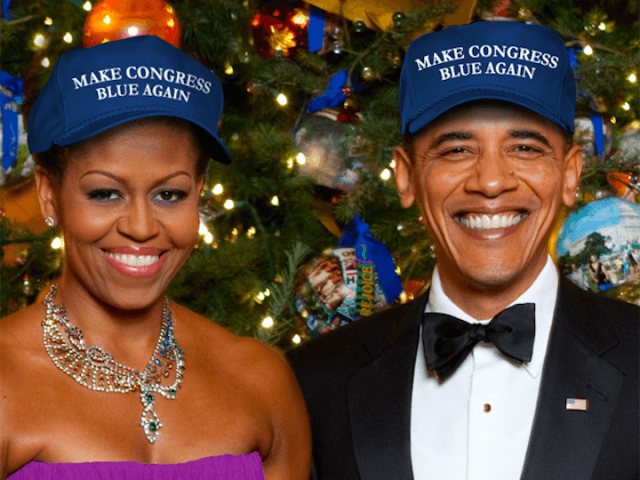 The DCCC’s hat comes in blue, and says “Make Congress Blue Again.” Unlike various outside efforts to troll Trump (“Make America Hate Again,” et cetera), the DCCC’s hat seems an earnest effort to appropriate a slogan that has proven the most effective of the cycle. Democrats, who need 30 seats to win the House, are ambivalent about Trump. Some boast that Trump would be the easiest general election opponent for Hillary Clinton; he is one of the only candidates with worse approval ratings. The DCCC has let it be known that it intends to tie vulnerable House Republicans to Trump. “You can denounce his comments but that only means so much if you would still vote for him,” a DCCC official told Roll Call recently. At the same time, Democrats are quietly worried about Trump’s ability to motivate disaffected voters to come to the polls. Indeed, Trump–and his hat–have set the agenda for 2016. Imitation, as they say, is the sincerest form of flattery.